For many, going to the dentist is an extremely stressful experience. Whether due to fear of pain or a bad past experience, millions of people avoid going to the dentist every year because of dental phobia. At Ridgepointe Dental, we pride ourselves on being able to help all of our patients feel calm, cool, and relaxed during their appointments, and for our most anxious patients, we can offer a little extra help with sedation dentistry. Thanks to nitrous oxide sedation, we can finally take the fear and nerves out of your dental care. Nitrous oxide has been used for over a hundred years to help dental patients feel more comfortable while receiving treatment. A patient simply inhales the odorless gas through a small nasal mask during their procedure, and with it, they’ll feel warm, happy, and completely relaxed. Even better, once the appointment is over and the mask is removed, the gas’ effects wear off almost instantly, allowing a patient to return to their day instantly. If you’ve avoided going to the dentist for years because of fear, we can help. 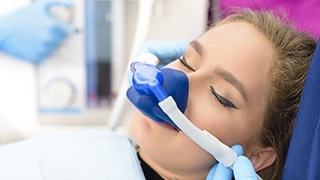 Just give us a call and let us know that you would be interested in nitrous oxide sedation, and we’ll make sure you have the easiest dental experience of your life.